Usually, I’m good and take pictures of every single thing I eat on Tuesday, but forgive me for totally blowing off my camera at every meal yesterday. It was just one of those days. Plus I have this habit of sticking my hot oatmeal in the fridge for 5 minutes before I eat it because I can’t wait for it to cool off on it’s own. Do you know what oatmeal looks like after it sits in the fridge for 5 minutes? It ain’t pretty. So that’s where breakfast went, and by the time lunch rolled around I was feeling too low blood sugary to do anything but stuff a WF egg salad sandwich in my mouth. Plus that peaceful solitary lunch I had planned for myself on the patio turned out to be what everyone else had planned too, so I decided to cool it with the food photography. I do that enough at work. And let’s not even talk about dinner and how the sun is going down earlier and earlier by the day. Before this gets any more wordy (story of my life), I’ll just get to it and provide you with some meals I’ve eaten in the past few days. You didn’t think I was going to skip the party did you? Have I mentioned that I love Heather? 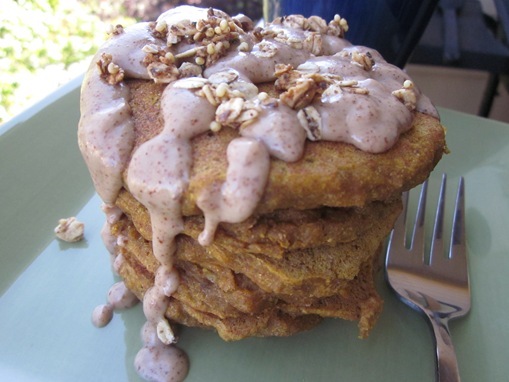 And her pumpkin bread pudding pancakes. There’s too many delicious sounding words in that recipe title to not have tried them. Alongside a pumpkin spice steamer. And then a nap. Oh wait, I had to go to work afterwards. Bummer. Almond milk-thinned maple almond butter and granola on the top. Please excuse my tupperware. This salad hit.the.spot. Tofu…that set off my fire alarm. Roasted chickpeas a la Mama Pea. 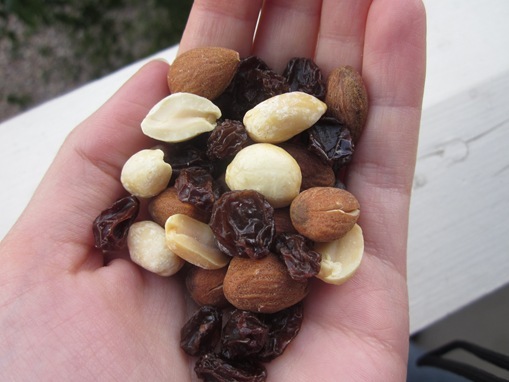 Lately, I pretty much alternate between “trail mix (aka whatever nuts/seeds/dried fruit/chocolate I have on hand),” Luna bars and cereal. 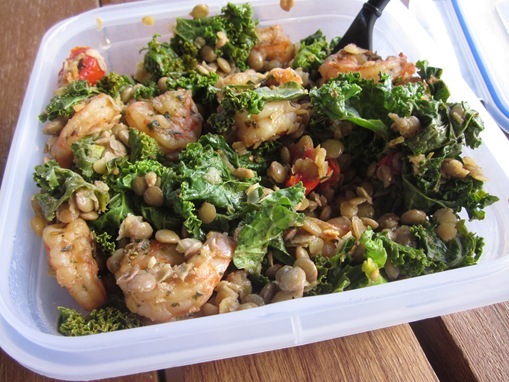 Okay sorry, excuse my tupperware again. This dinner was too good not to share though. 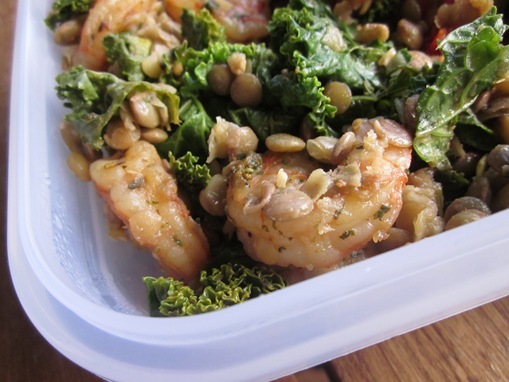 French Lentils with Kale and Shrimp. I have an unhealthy obsession with shrimp. After I had the worst dinner of my life at the Cherry Cricket in Denver (post to come??) last Friday, I dragged Joey to Whole Foods for something more satiating than a glass of Woodchuck. Then found myself staring at this case. Then pried myself off the glass long enough to find some “real food,” but ended up back in front of the truffles again. How do you even choose between all of these?? I left with an espresso truffle and knowledge that if you’re nice enough to the confectioner he’ll let you taste the mojito truffle for free. Score! The happiness of my taste buds: priceless. As always, thanks to Jenn for hosting the WIAW party! 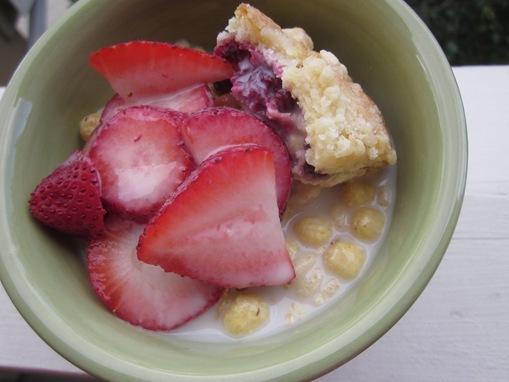 Best thing you ate today (or within the past few days)? Dream truffle flavor? I kind of wish I had tried one with sea salt on top! Ooo, salt and chocolate is always a good combo, yeah, I’d definitely try that one (for free, especially 😀 ). WF desserts are amazing. Yeah. Now I want a WF bakery cookie. Cookie flavored truffle? And that salad looks TOO GOOD, and I usually don’t get very fired up by salads. Best thing I ate today, it sounds lame but the yogurt bowl this morning was AMAZING! I’ve really grown to love sea salt and chocolate together… get one next time! I can’t decide what my favorite meal was today 0 perhaps my leftovers from last night! I don’t mind the tupperwear at all!!! 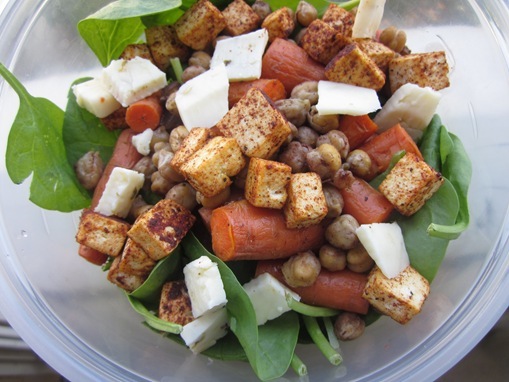 The tofu, spinach salad looks awesome!! 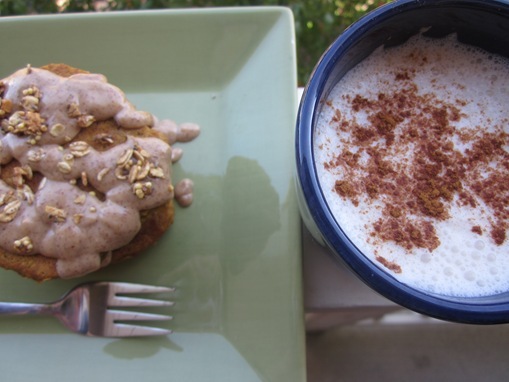 And those pumpkin bread pumpkin pancakes…. must have!! I love heather’s recipes. They are soo delicious. The chocolate case at whole foods is ridic. I live in Austin by the flagship store, and our chocolate section is AMAZING. 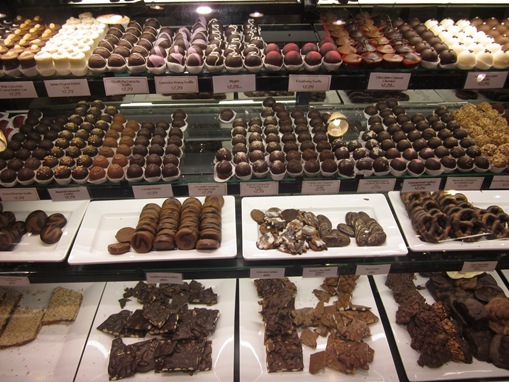 It’s like a small chocolate shop inside a huge store. 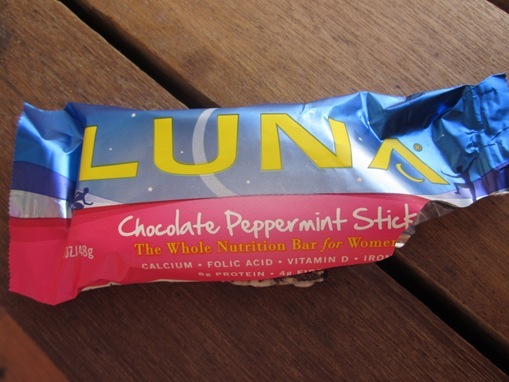 That is my favorite flavor of Luna bars as well! So so good!!! Also, I have dessert envy right now looking at that dessert case! That is my fave Luna flavor ever, it’s so good!!! !